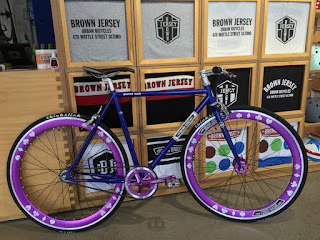 Brown Jersey: Fixies with Colour are back! Fixies with Colour are back! Check out our custom 'Divvy Van' fixie with high profile violet anodised rims, violet anodised Novatec Sealed Bearing hubs, violet Brown Jersey 'Scaracen' chains, Thickslick tyres and all the goods. Hit the red 'Customise this bike' button and go for your life!